“When I see an adult on a bicycle, I do not despair for the future of the human race,” said British author and futurist H.G. Wells. What is it about the humble bicycle that rings our bells, so to speak? Is it the fact that you can get to and from work, school or the shops and stay fit at the same time? Or is it the convenience that comes with getting from point A to point B at your own pace without having to worry about getting stuck in traffic, the rising cost of petrol or getting a seat on public transport? Or maybe it is, more simply, a feeling of freedom. Most probably it is a combination of all of these things. • the serious cyclist kitted out in tight lycra and a fancy water-bottle pouch. The myriad health-related, economic and environmental benefits of riding bicycles are well known and well documented. Yet, despite upward trends in some cities across the globe in recent years, only 0.55% of American commuters ride bikes to work. So, what will it take for more people in your city to bike around? 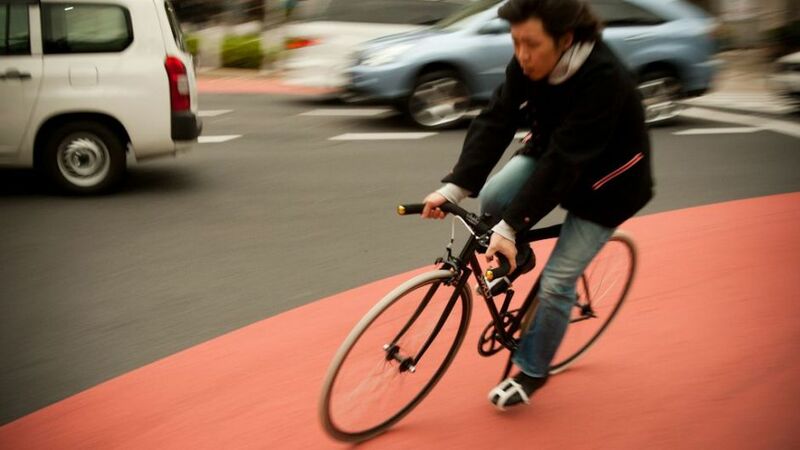 There are lots of initiatives here in Japan to promote cycling. One good example is the Green Pedal Map – for your precious bike life! The map in English and Japanese provides information on bike lanes, danger zones, rental locations, bike parks and so on. However, the most desirable answer is real leadership in urban development and planning that makes bike-riding a safe and practical alternative to the motor car. In many large cities right now, for longer trips in particular, many potential cyclists would say that riding is ‘too dangerous’, ‘too time-consuming’ and ‘too sweaty’. Strategies for change should enable safe riding across cyclists’ journeys, from their bike racks at home, to work, school and the shops, and back again. Good policies include coordinated local and national government investment in bicycle infrastructure such as bike lanes and paths and parking areas. Businesses also have an important role to play in making showers and safe parking areas available for their employees — this can only be beneficial as physically healthier employees make happier and, of course, more productive workers. Luckily we do not have to look too far to find creative and successful initiatives that have already worked. To give just one example, in Oslo, Norway, the affordable public bike system has received widespread acclaim and is being copied in other cities around the world. Despite these innovations, the more likely catalyst for change in the long term lies in higher petrol prices. In 2008 we saw how the economic incentive to ride to work increased due to petrol price hikes. A survey by the US organisation Bikes Belong Coalition found not only that bike sales had increased significantly, but also that customers in 95% of surveyed shops cited high petrol prices as a reason for their purchase. If, as those who believe in peak oil expect, petrol prices continue to rise (oil prices have doubled in just 12 months ), then communities of all sizes should anticipate this trend and prepare for it. Ironically, transition to a bike-friendly city will be most difficult in cities like Los Angeles with poor public transport infrastructure and populations attached to the comforts and speed, at least in theory, of the motor car. Many cities with efficient transportation infrastructures, in particular through trains and subways, make it attractive to ride only to the nearest station or for short trips. Therefore, catering to a range of commuters in car dependent cities will also require substantial and integrated investments in public transport infrastructure. In recent years in the spaced out capital of Australia, Canberra, the Bike’n’Ride initiative has provided an incentive for potential cyclists to ditch their cars in favour of a convenient bicycle and bus combination. Bike riders who ride to a bus stop can attach their bikes on the front of the bus for free. Other integrated solutions include congestion charges for cars in the inner areas of cities like London, which encourage people to use more sustainable forms of transport. Still, instituting these changes in large North American, Asian and increasingly African and Latin American cities that have not been planned with the needs of cyclists in mind will require more than infrastructural change. A real bike-friendly city requires citizens that understand, and are open to the idea of bicycles being part of the urban fabric. This can only come as more and more people experience the benefits of riding and themselves feel a sense of pride in having a bike-friendly city. An important cultural value will be inclusiveness. Bicycles are not, and should not be seen as the domain of a group of hard-core fitness orientated riders. Rather, there should be spaces that enable people of all ages, genders and social statuses to ride with each other and alongside pedestrians and road vehicles. 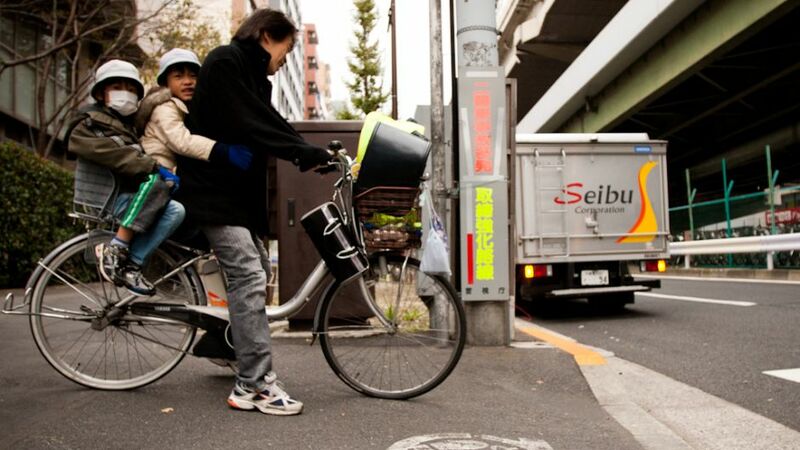 In Tokyo, those walking on crowded sidewalks are accustomed to sharing limited space with those cyclists who would prefer not to pedal on the street. Pedestrians are willing to step aside to allow cyclists to pass and cyclists are (generally) patient and careful at making their way through the throngs. All of us can lead the pack in fostering this culture. With obesity such a problem in developed societies, as well as a growing problem in developing countries, adults who ride can provide a good example to their kids. Or maybe, it’s the other way around. Evidently, if decision-makers — politicians, policy-makers and urban planners — use bicycles themselves, they are probably more likely to initiate forward-thinking bike-friendly policies for their constituents. The Danish Minister for Climate and Energy rides to work, along with 37% of Copenhagen residents. How does your city mayor or state representative get around? Changing attitudes towards bicycles will take some time. Societies overwhelmingly view the road as a space for cars and trucks. The hope is that the freedom to pedal is not abused by zealous riders, in the same way that the freedom to drive is seen, incorrectly, by many to be an entitlement. Now tell us about your bicycle love story. Bicycles: a love story by Mark Notaras is licensed under a Creative Commons Attribution-NonCommercial-ShareAlike 3.0 Unported License. Sean Wood has been the Creative Director at the UNU Media Studio since 2004. Over the past 20 years he has worked as an art director/designer in motion graphics and interface design. This includes experience with design companies in Sydney, Hong Kong and Tokyo. He has worked for an extensive range of clients from multi-national corporations to small design studios. He was won numerous awards including the Hong Kong Design Association’s excellence award and the Society for New Communications Research 2007 Award of Excellence in the education division. I get quite a little workout for myself on my Raleigh Mojave by bringing my backpack to the filtered water dispensary, and lugging back two full gallon jugs on the way home, uphill. It’s my after work stress burn off. On the notes of bicycles and culture – it’s disheartening to see negative cultural groundswells within the neo-conservative base, as they view any sort of energy conservation as un-American. Thanks, as always for your interesting comments Andy. That does indeed sound like a major stress (and calorie!) burn off. Maybe I should stop drinking from the tap and follow your lead. ; )As for the Tea Party nonsense, I had to go check it out because I just couldn’t believe anyone could say something so ridiculous. I wouldn’t be disheartened if I were you, I think it’s exactly that sort of pathetically paranoid stereotyping that will bring well-deserved ridicule and could turn the polls around.So please: cycle on! My bicycle love story? Well, it all began with a pedal car when I was about three…but I won’t bore you by going back that far…though I will go back three decades to my teens when I fell in love with the aesthetic beauty of a bicycle’s simple mechanicals. Indeed, this newfound passion caused me to seek out a fine racing bicycle which I not only rode with growing enthusiasm, but hung on hooks in my bedroom so I could admire it early and often.I credit this personal discovery of bicycling magic with another significant development in my life, for these two-wheeled devices allowed me to discover a hitherto unknown aptitude I had for sport. Coming from a bookish family with precious little propensity of exercise, it was through admiring bicycles’ fine lines that I ended up winning lots of races.Who knew? Certainly not anyone I’d grown up with…for this sudden turn of events came as a great surprise to all who’d previously written me off as a hopelessly nerdy teenager (including myself! ).So, let me take this opportunity to show my public appreciation to the humble bicycle…personal miracle-maker, utilitarian world-saver, and just attractive enough to be an art piece suitable for hanging. Well now, that is quite the love story! Thanks for sharing, Alan. I too have been cycle-crazy since I was a kid, but back then it was more banana seats & baseball cards in the spokes than athleticism. As I grew up, my aesthetic tastes changed several times, but I never did outgrow the feeling of freedom and peaceful simplicity that pedalling has always given me. Of late, I’ve been anxiously awaiting my sleek pumpkin-coloured Tokyo Bike’s arrival to Madrid (it, oh and my other stuff too, finally gets here tomorrow!) and since apparently bike theft is quite rampant here, you’ve given me a great idea for safe and funky storage. There’s a spot for it right over there in the corner next to the window! I hope your Madrid move has been a smooth one! for this earth and every one of us who lives here, including me and you. Back in my “pre-full-professor” days, I commuted to work nearly every day on a cheapo bike I bought in a garage sale. I did that for about 9 years and it enabled us to be a one-car, one-income family and I figure that I saved enough money to put one of my daughters through college. Later, the sweatiness of biking ended that (it is 80 ˚F in the morning and > 95 ˚F in the Texas town where I live for several months a year). I packed on weight was slipping into couch potatohood. Six months ago (when it was still cool) I started biking again and my fitness level has risen dramatically. I’m feeling a lot better, my waist equals my inseam again – but hey, let’s face it, I’m sweaty again. Way to go T! Keep on sweating! Boconn13, that is an amazing bike ride. Thanks for sharing. 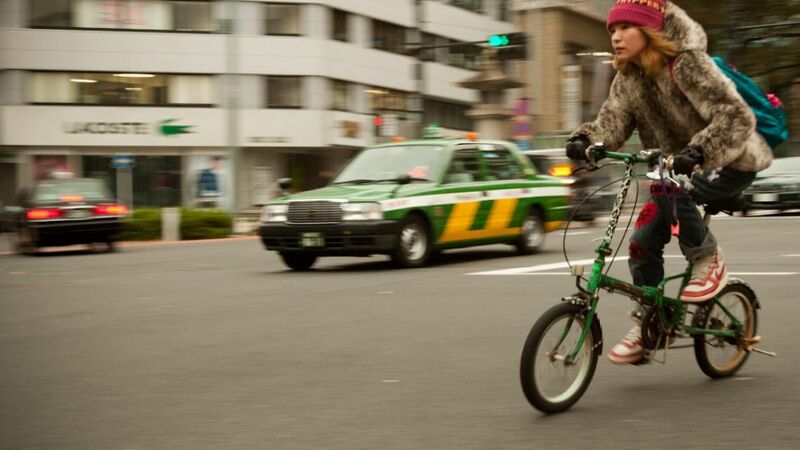 Makes me want to share my ride in from my home to Shibuya in Tokyo. It is kind of hilly and takes 30 minutes. Can’t cycle it at the moment because it is too hot – but will as soon as it cools down again. Outstanding! Riding a bike definitely gives you a better sense of place than one gets being ensconced in a car or bus, as evidenced by these photos. I could almost smell the scents as the scenes passed by. Nice! Brendan, please do share your Shibuya commute when you can. Having just visited Portland (c/o Boconn13), it would be nice to get a sense (scents?) of Tokyo, too. Yes, I feel inspired to stick a video camera on my helmet and cycle in. Could be fun. What a nice story to pick up 🙂 I’m a Londoner with a fixed gear bike fetish and this is an apt topic indeed given that we’re barely a month in to a new central London cycle hire scheme [http://www.tfl.gov.uk/roadusers/cycling/14808.aspx] (think Paris), buoyed along by a mayor who can be seen quite regularly on two wheels. So there’s your answer to that! While the scheme is facing skepticism around the desperately overt sponsorship by Barclays, it seems to have struck a note with a London public as cycle sales soar and increasing numbers of companies endorse ‘cycle to work’ schemes with local cycle stores. It all looks very rosy. But London’s majority traffic – the bigger, heavier, faster, scarier type – isn’t quite on message yet. Motorbikes and taxis legally using bus lanes continue to encroach on cycle space; trucks and vans are still not checking their near-side before turning as much as they ought, and often give little or no room at traffic lights. Making that transition to the cycle can still seem all too daunting. So yes please motorists, try it. Not only will you love the feeling of achievement and wellness, but you’ll also see just how much protection and understanding cyclists need on the road. However we have to accept also that not all cyclists are helping the cause: red-light-jumpers are simply dangerous to pedestrians, and annoying to motorists and it is dissolving the integrity and sympathy for cyclists. Plus the competitive and impatient riders (sorry guys, it’s usually us) make commuting seem like a race, and some would-be cyclists are being put off by a perceived loss of the romance of an egalitarian and ever-so graceful form of travel. Me, my wife and daughter all bought new bikes a few months back. My son still has his old bike. We use them for shooting around our local area, to the parks, local store and to the sports centre and swimming pool. We just love the freedom and flexibility that cycling offers. Its an endless one. Riding my bike was always an expression of life quality for me. There was one year I had to commute by car from and to my workplace one way 45 minutes. In school I went by bike every day approx. 20 minutes, even it was very cold. During study the bike was my vehicle. My first time and job in Berlin this was the one and only necessary transportation vehicle as well as in Hamburg. I just feel good on the bike. Wow, that looks so dangerous Stephan!! 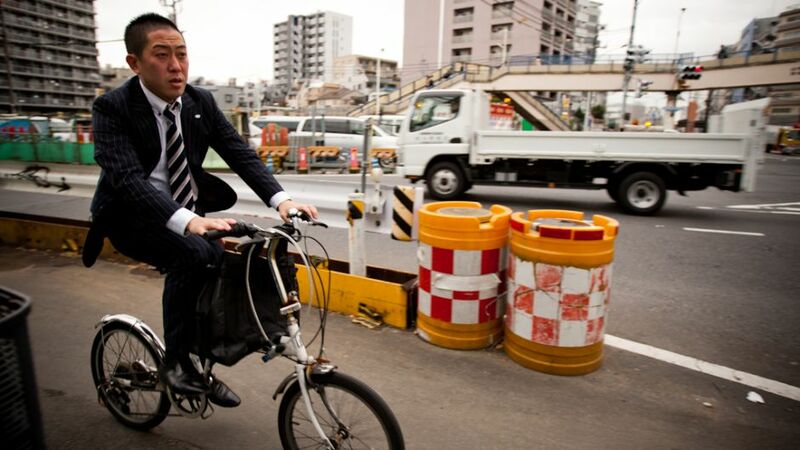 At least you were respectful of the red lights, when most Tokyo cyclists just carry on through them. It’s sad to see HG Wells’s memory disgraced in this way. Almost as bad as Darwin’s alleged deathbed conversion.Wells was writing in the days before the motor car was widely used and extolled the virtues of bicycles as a modern, technological alternative to the horse. I’m sure if he was around today, he’d be delighted with many aspects of where our technonogy has taken us.I dare say he’d look down on cyclists. Thanks for the comment eddie. I am not as confident as you are about how HG Wells would think about cyclists today. What makes you think he would look down on cyclists rather than say motorists? eddie – why would Wells (a complex person for whom it would be presumptuous for anyone to speak on behalf of) or anyone else look down on cyclists? (Again if you consider, falsely, that cyclists are a monolithic grouping). I would also be interested to hear more details about any downsides you feel the bicycle has – are the health, financial, social and environmental benefits mentioned in the article and comments not true or exaggerated? What other technologies are you referring to? Great Stories!!!!! go to mybikeridestory.yolasite.com and share youre story with us!!! It’s a shame I haven’t ride a bicycle since I was 8. The clean transport that we have, and still almost nobody use it. We still like our comfort instead of the public benefit of having a clean world. Erick, it’s never too late to revisit one’s childhood! Are you not tempted to give it a go? Start by renting one for a few hours – I have a suspicion that you’d easily be hooked again! So many thanks for this. ‘Nuff said. I used to cycle to work everyday. Around 45 minutes one way. I was cycling really slow so I did not think it was much of exercise… but as soon as I stopped it I began to gain weight.